Friend attended a tasting event recently and was asking about a particular wine. Mentioning that the grapes were grown in volcanic soil, he asked me if that meant the wine would have the taste of magma/lava? While the question definitely made me laugh, it did get me thinking about how grapes are affected by the soils they are planted in. 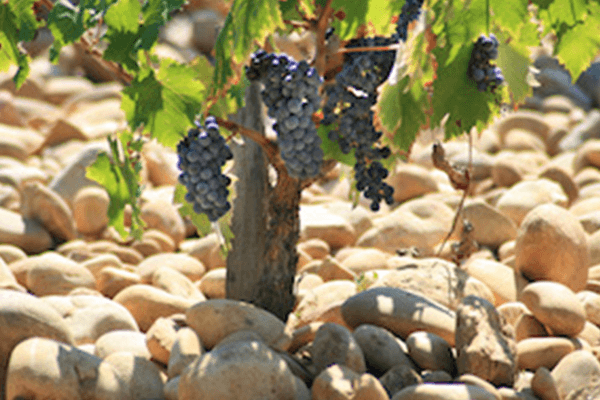 Many of us are familiar with the French term of terroir. Terroir is a confluence of soil, temperature, elevation as well as other factors that all impact how grapes will grow. One grape vine grown in a hot vineyard in Australia will produce a certain type of grape whereas that same grape vine planted in a cool climate in Germany will produce something entirely different. But what about soil, specifically. If a grape is grown in rocky soil, such as slate, will the grapes taste like slate? I read about an interesting experiment conducted by Randall Grahm, of famed CA winery Bonny Doon. As reported in an interesting story written by Jamie Goode, and published in Harper’s Weekly back in 2003, Grahm added rocks (granite, cobble stone, black slate and Pami pebbles) to a barrel of wine. They smashed them up and waited for a certain period, until they felt that the wine had extracted interesting flavors. Terroir to the extreme! Dawid Saayman is a South African viticulturalist who has expertise in matters of terroir. He does not believe that minerals taken up the vine can register as minerality in the wines, rather that minerality appears to be more a result of an absence of fruitiness. The reality is that soils differ in their chemical and physical properties. Different types of soil will have different properties, particularly with respect to how water supplies the vines. Drainage will affect vines and the nutrients that are passed along. If the water table is low in a particular soil, that will impact and stress the vines (perhaps a very good thing.) Too much water in the soil will impart “watery” characteristics to vines. Different soils will affect nutrients differently. Growth of the vines will vary. We believe that grape growers know their own vineyard soils best. Having years, decades, even generations of knowledge allows grape growers to understand their vineyard properties and grow what they know are the most appropriate grapes for the soils of which they are the caretakers. So back to our original question: will grapes taste like the soils they are grown in? Perhaps. You’ll just have to drink more wine and decide for yourself.